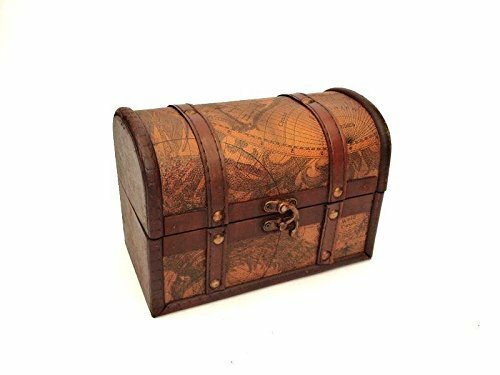 This is a beautiful treasure chest with a vintage design of an old world antique map printed on the top and front. It is made out of wood which is stained a dark colour and shaped in a traditional colonial style with leather strapping and metal antique brass coloured studs. These boxes are hand crafted so please expect each one to differ very slightly from each other. Size: Large - W13.78" x H9.06" x D9.06"
Medium - W11.02" x H7.87" x D7.09". Small - W7.48" x H5.12" x D4.33"
If you have any questions about this product by Homes on Trend, contact us by completing and submitting the form below. If you are looking for a specif part number, please include it with your message.